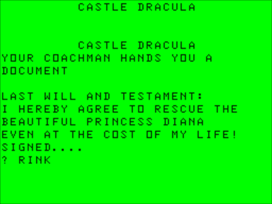 Castle Dracula is a text adventure game written in BASIC and was also available for the Spectrum, MSX, Commodore Plus/4, Atari 64K and the Texas 99/4a. 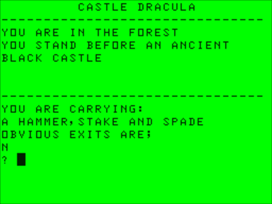 The original much acclaimed macabre adventure. Travel the Borgo Pass in gothic Transylvania on a journey into terror. Explore the sinister black castle. Meet Frankenstein, the wolfman, & other grizzly inhabitants in this black rainbow of horror. The gates of hell await! 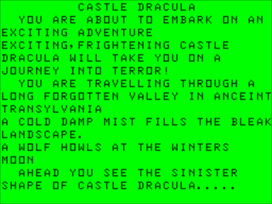 However the advert is misleading, for in the Dragon version there is no mention of Frankenstein, his monster, or the wolfman anywhere in the game. This page was last modified on 27 April 2015, at 23:20.